Ace 3102 leads northbound train ACE 04 passes the Agnew Depot on Tuesday January 29, 2019. This year both Susie and I are retired and living in San Jose. Trips of a day or less. A day at the train club. This was a trip from San Jose to Napa and return. I spent the night Saturday in Napa. I was there for the Winterail 2019 pre-show. I drove from my home in San Jose to Napa stopping at Napa Junction on my way to the Winterail Rehersal in Napa, CA on this day. After the Saturday Winterail Rehersal I stayed in Napa. 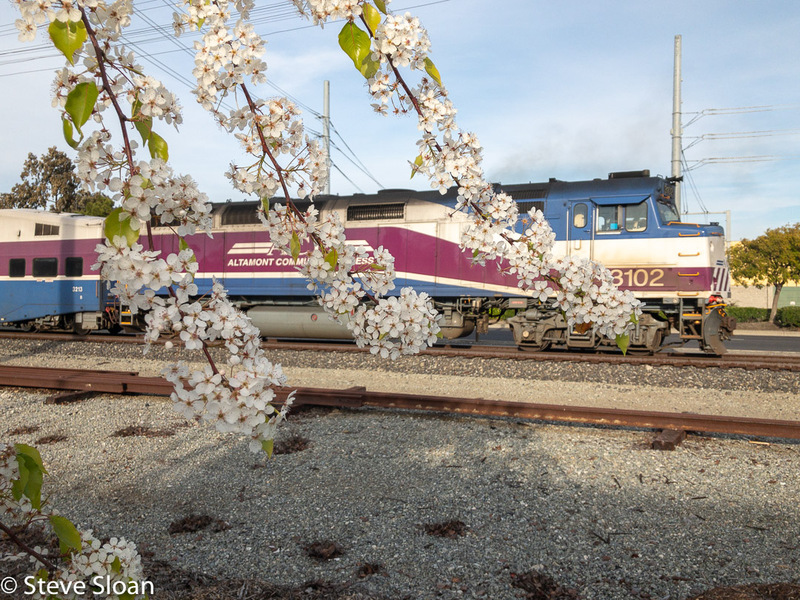 On Sunday March 10, after photographing Napa Valley RR excursion activities and equipment, I returned home. From March 13 through March March 18, 2019 I did a road trip from San Jose to Oregon and return to be part of the team that put on Winterail 2019. There's this related set of trip photos on Flickr. This day I left San Jose in the morning and drove to Eugene where I stayed at my friend Diede's place. I photographed Cal. Northern, and scenery photos, on my way to Eugene, OR. This day I started in Eugene at my friend Diede's place, driving from Eugene to Springfield. We had lunch at the Cornbread Café in Springfield. After lunch she and I said goodbye. I photographed UP and Amtrak in Springfield and Albany on my way to Corvallis, OR. This day I was in Corvallis. At the motel I went to my truck and found it had a nail in the in the left front tire. I spent a good part of the morning in a tire store. Luckily, the nail did not go through, but I did not get a lot of train chasing done this day. I met Vic and the crew at his house and from there went to the high school for set up. This day was spent in Corvallis. It was the day of Winterail 2019. This day I went to Garibaldi on the Oregon Coast where I visited the Oregon Coast Scenic Railroad. This day I returned home, driving from Corvallis to San Jose. I chased the Albany and Eastern and had lunch at the Cornbread Café in Eugene.